Students from Stanford University’s canceled Bloody Bloody Andrew Jackson musical production stage Did We Offend You cabaret instead. What to do when asked not to sing about Andrew Jackson at your college. 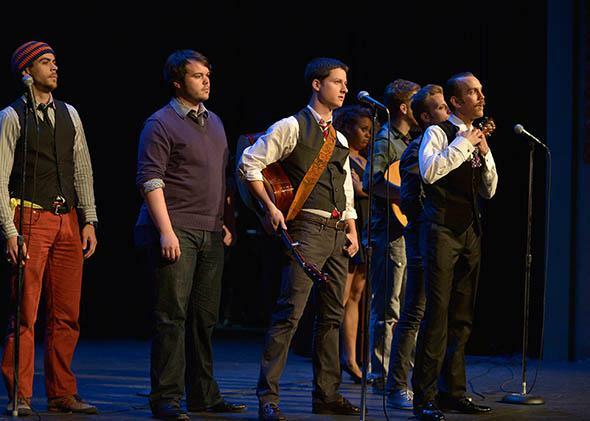 Members of the SpeakEasy Stage Company perform selections from Bloody Bloody Andrew Jackson on May 13, 2013 in Boston. A Stanford production was canceled. As a satirical rock ‘n’ roll take on President Andrew Jackson’s controversial life and presidency, past productions of the musical Bloody, Bloody Andrew Jackson have drawn protest. At Stanford University, the protests—and ultimately, cancellation—of the musical came before the cast had even met for their first rehearsal. And so Stanford students ended up performing a cabaret called Did We Offend You? instead of the Andrew Jackson show. Did We Offend You? included controversial songs from several musicals including Rent, The Producers, and the now-canceled Bloody, Bloody Andrew Jackson. Bloody, Bloody Andrew Jackson recasts America’s seventh president as an angsty indie-rock star singing his way through the Battle of New Orleans, the formation of the Democratic Party, and the violent forcing of Native Americans to move West. The musical satirizes and criticizes Jackson’s life and legacy—including the Indian Removal Act, which led to the deaths of thousands of Native Americans—and the dangers of unrestrained populism. “The concerns from the community were about both the show’s satirical commentary on the issue of Native American genocide and the historical inaccuracies that could be inferred from the story,” Cannold said. Generally, Matthews’s view is the same one critics had of the New York City production: that it portrayed Jackson as a brutal, ignorant oppressor of Native Americans and white America as loving him for his actions. In the musical’s production notes, the writers urge anyone performing the musical to avoid stereotypical and offensive portrayals of Native Americans. At Washington University, Matthews is currently also directing a production of Bloody Bloody Andrew Jackson. For the Stanford American Indian Organization, the concerns went deeper than just whether the Native Americans were portrayed as stereotypes in the musical or if Jackson was portrayed as a hero, said Ashley Harris, the group’s co-chair. At the Fountain Theatricals and the Bloody, Bloody Andrew Jackson team proposed several ways of ensuring that the musical’s intent was clear and improving representation, including funding a separate musical from a Native American perspective, but an agreement could not be reached. No script changes could change the fact that Native Americans were not part of crafting the musical’s portrayal of Native American issues. In the end, the musical was canceled, though Cannold said the production team is not angry about the decision and that the conversations between the two groups remained respectful. Did We Offend You? premiered last weekend to a sold-out audience. Peter Bonilla, director of the Individual Rights Defense Program at the Foundation for Individual Rights in Education, said he was happy to see the students “taking lemons and making lemonade” by creating a cabaret about controversy, but said the cancellation fits a larger trend of students using protest to silence uncomfortable perspectives rather than using protest to make an argument. Those protests are usually about controversial commencement and guest speakers, however, not student productions.